Whether you are planning a birthday party for your child, a church or school event, or even a company picnic, or just a fun day in the sun we can help make it the best event possible. We are licensed, insured, and permitted to be at any park or school in the greater Tucson area. 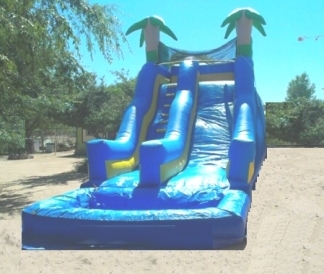 The 20 foot tropical slide Rental Tucson Arizona will be just what is needed to cool everyone down. Never before have your children experience such excitement as they drop two stories and find themselves in the wonderful cooling pool at the bottom that embraces their journey that feeds the imagination. Here at Jumpmaxx we pride ourselves in the fact that we have Unbelievable Slides and unique units to the Tucson area. You will find yourself surounded by a tropical holiday no farther then your backyard. Imaginations of your children and the thrill of a big slide will be something they will remember for years to come. There is a pool at the end of the slide. This slide is great for all ages. Jumpmaxx has the Big slides everybody loves. JumpMaxx has worked hard and long to provide to you the most unique and wondrous inflatable products to entertain your family and guests at any party, event, and fund raiser. How else can Tucson, Az keep its cool in its unbelievable heat other than a trip to Mt Lemmon?Call now to book at (520) 445-8029 and find out for yourself to see why JumpMaxx believes that busy kids make great parties! We appreciate your business and love reviews! Don’t forget to like us on Facebook, link is at the bottom of this page.Book early as this inflatable is in high demand and it is first come first serve. JumpMaxx prides ourselves in providing America with newer, cleaner, high end entertainment with inflatables like the 20 foot tropical slide and many others.